Above all, the Mombasa weather is hot and humid. As soon as you open your plane or train door, the hot climate will come down on you like a wet hot blanket. It makes the climate a bit harder to bear than for example Nairobi’s milder weather. Even so, Mombasa's climate is milder than many other tropical countries. The warmest months are December to April, reaching an average maximum of 31C during the day. It's cooler in July and August, reaching just 27C as a high. As you can see, it's only a few degrees difference. Overall, the weather in Mombasa is very stable and doesn't change much over the course of the year. Don't confuse the rainy seasons with being the cool part of the year. The wettest months in Mombasa are April, May and June with May being the very rainiest (around 20 days of the month will have rain in May). The rainy seasons do mean frequent rain, but not exactly monsoons. There may be rain most days, but more in short outbursts during afternoons. Before and after, the sun shines again. The second, less wet rainy seasons is from October to November. 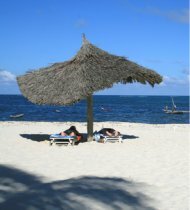 Frankly, the best time to visit Mombasa is anytime. With the Mombasa weather being so consistent through the year, the only thing you might want to avoid is the wet month of May. The same patterns of hot/cool months are found in Nairobi, but with a bit larger swing between lows and highs each day. If you are staying in the area, then there is little to worry about. But if your plans include safaris or other tours farther into the interior of Kenya, then you need to be a bit more careful. Most roads are not paved, and can be virtually unusable after days of rain. Some national parks are even closed during the rainy season. Moreover, since the vegetation is more dense in the rainy seasons, it’s harder to spot wildlife in the safari parks. On the positive side, accommodation and other tourist services are cheaper then. Overall, the Mombasa weather is splendid and pretty reliable. Very warm and sunny just about all of the time.